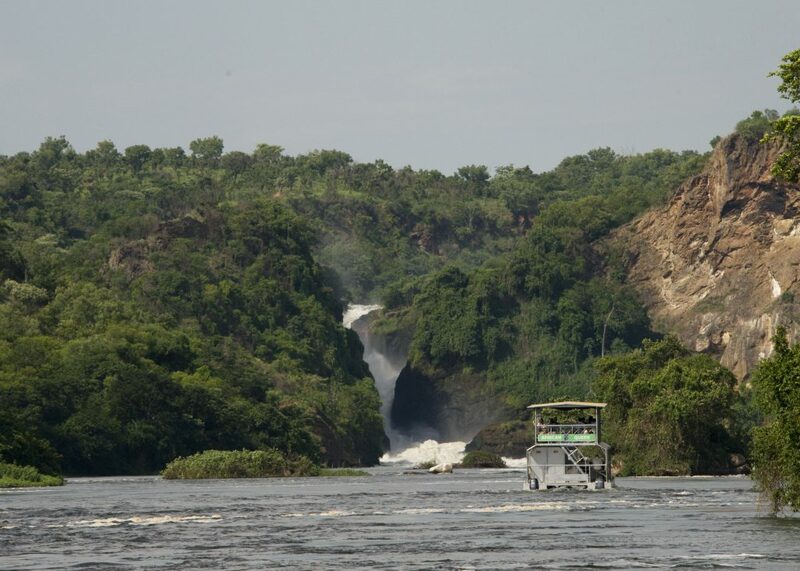 In the afternoon we did something different – a boat ride along the Nile. 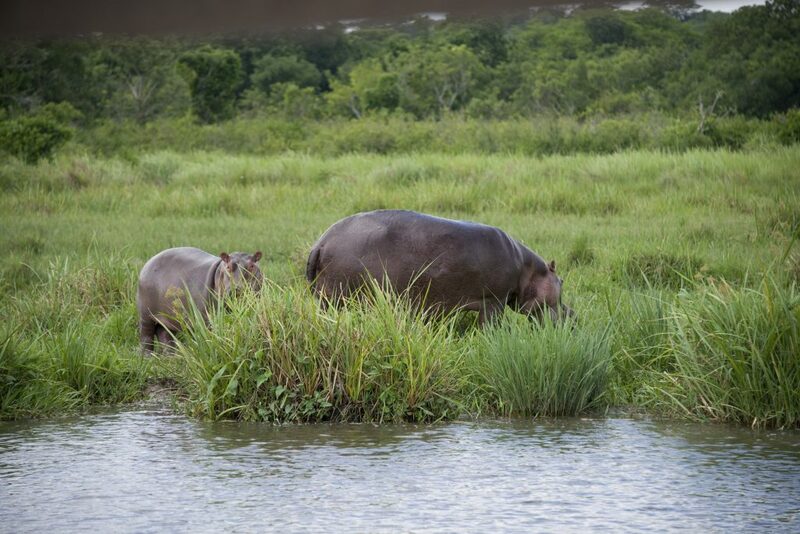 This way we could see the animals that tended to stay near the water as opposed to the savanna. 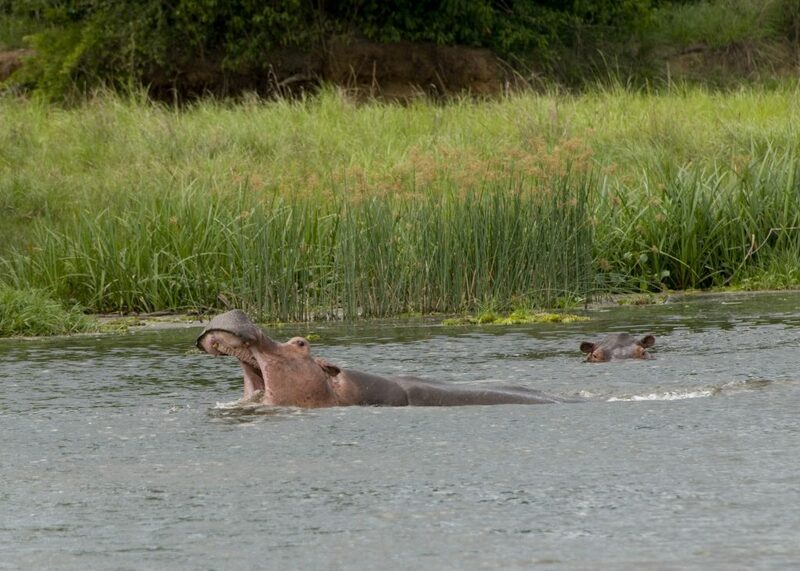 The most obvious are the hippos. This hippo is just swimming along, not attacking, just yawning. The one to the right is in a more common pose – just watching us. Mom and baby left the water. Mom is unimpressed by us. Baby is curious. 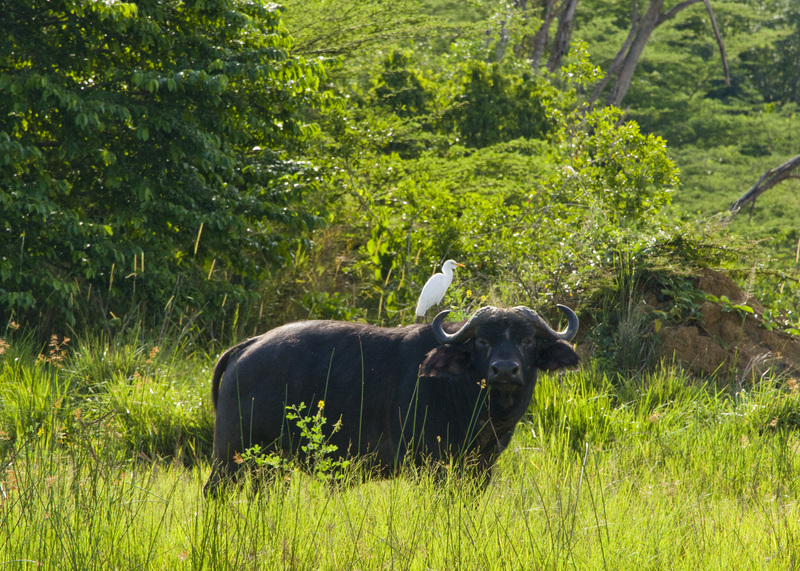 The African Buffalo is also very common along the shore. What I found fascinating was the birds which are constantly on, around, and wandering under the large mammals, feeding on the bugs. 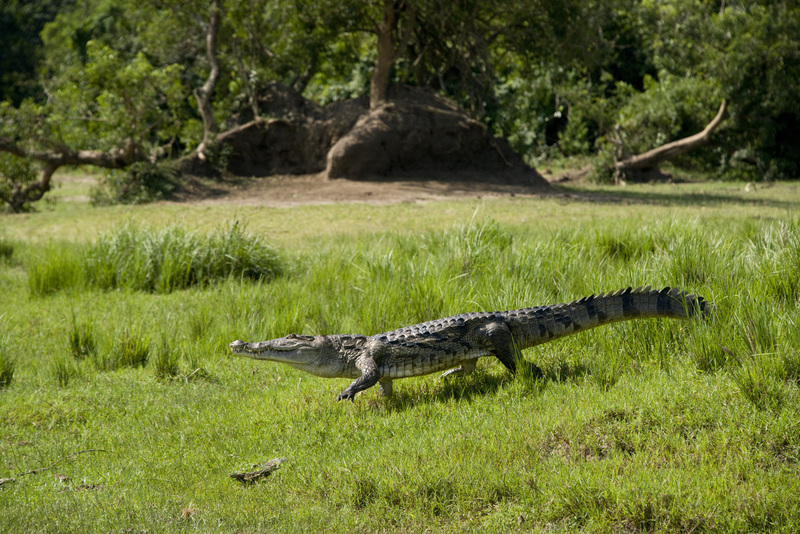 Of course, it wouldn’t be the Nile without crocodiles. This fellow was sleeping under a tree as we went past. His mouth is open to help him cool himself down. I guess we disturbed him because he headed for the water quick – yes, croc’s run. Another big treat for us was the elephants. 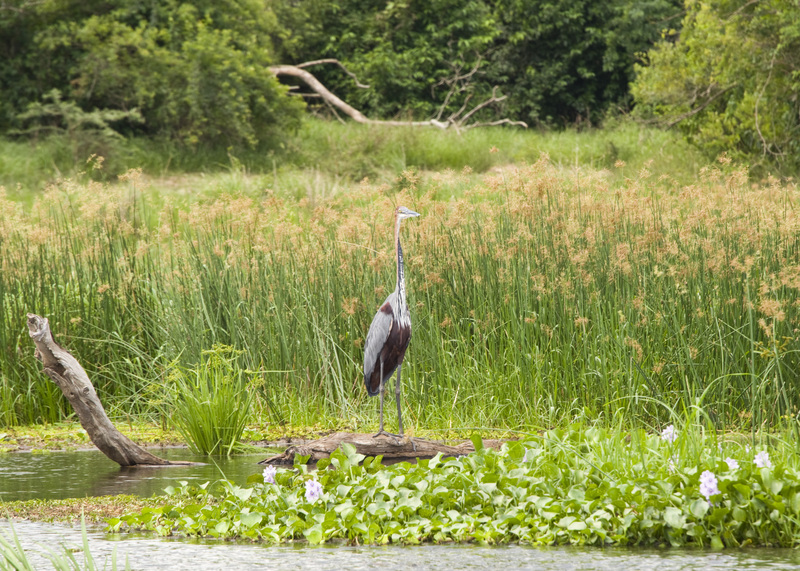 Solitary males were a pretty common sight by the river. 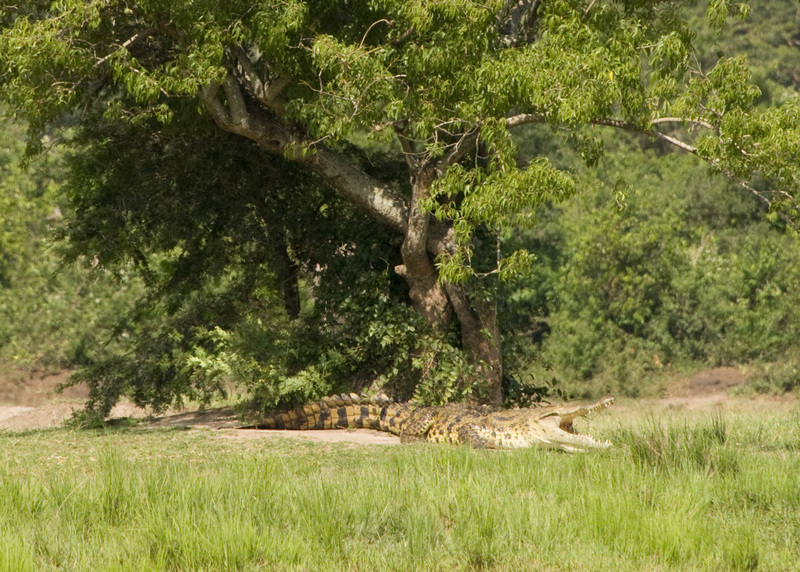 A young male wandering by. And by the way, that tree in the back ground is actually a type of cactus. 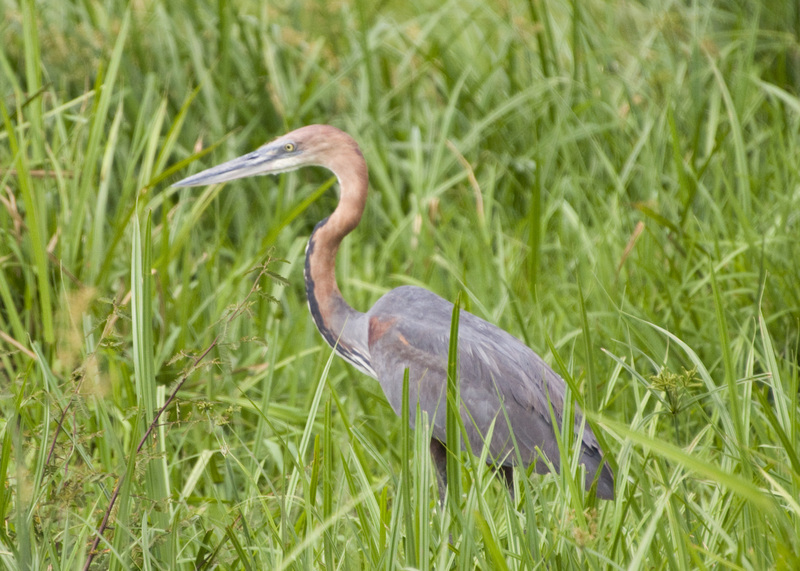 And, as you should expect in Uganda – birds! Beautiful birds. An African Jacana sitting by the shore. Just waiting for a fish to swim by. 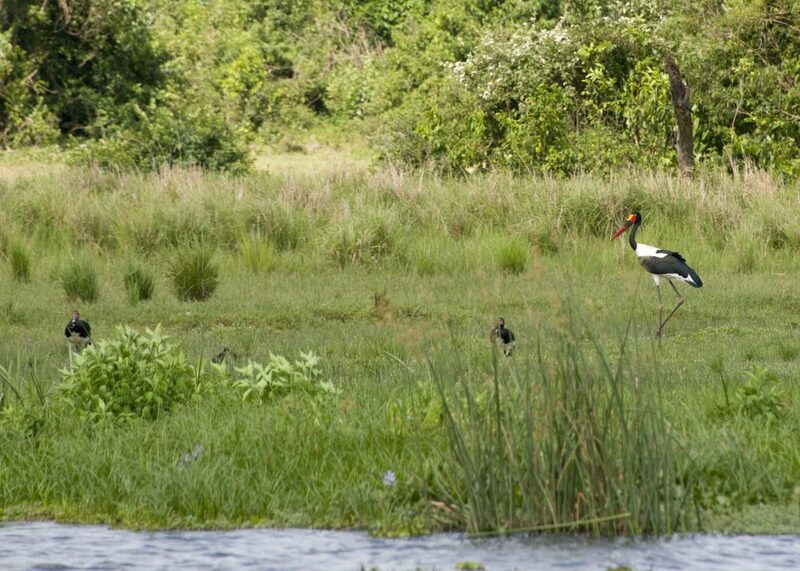 And my favorite – the Saddleback Stork. What coloration! 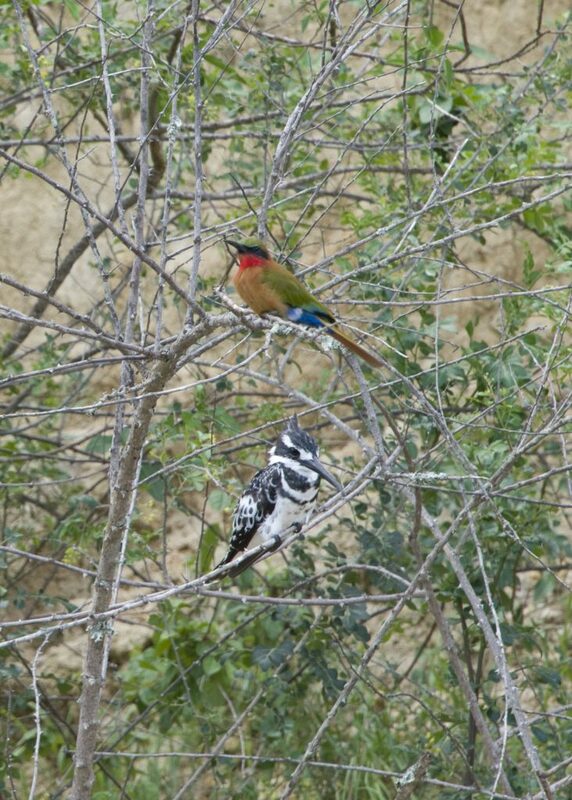 In the trees under the cliffs there were lots of Kingfishers and Beeeaters. 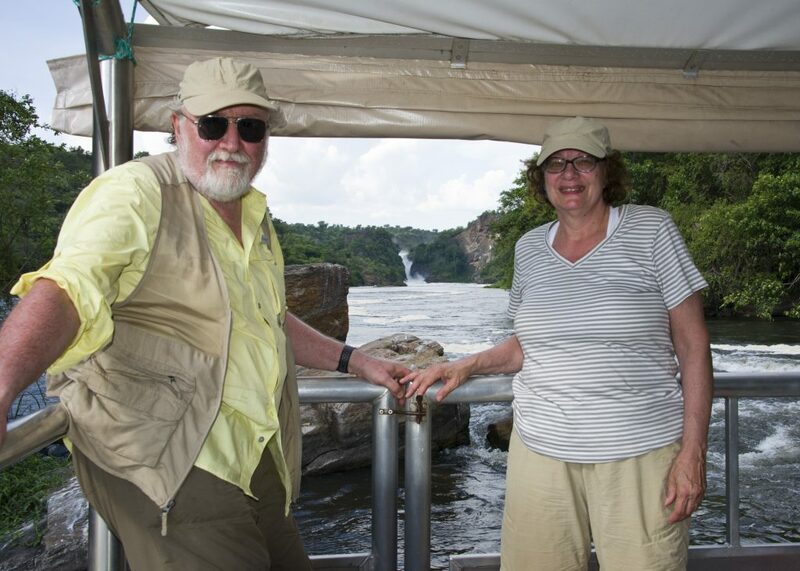 At the end of the trip we reached Murchison Falls where we started the day before. The Falls just ahead of us, along with the African Queen. Unfortunately neither Boggie nor Kate were aboard. And just to prove we were actually there. Back to My Trip to Uganda. It was really an amazing trip, you must have enjoyed to the maximum. 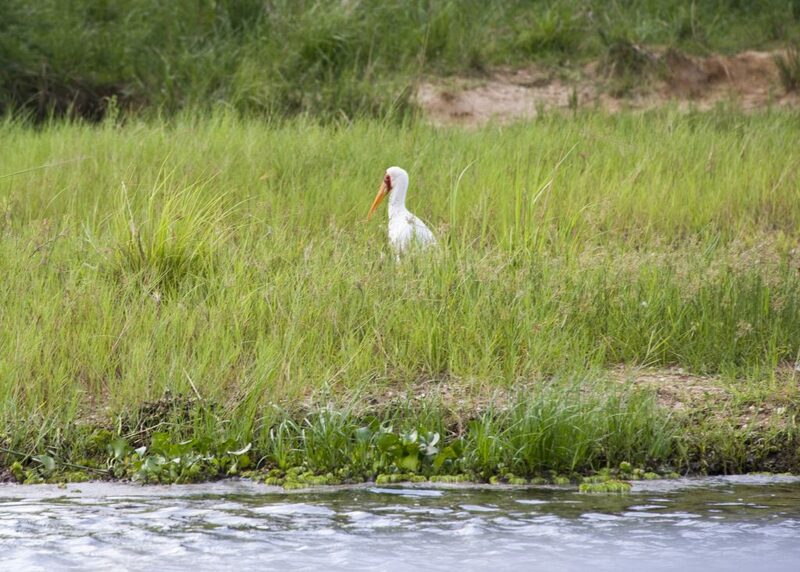 Just a collection, the bird with a yellow bill is not the spoonbill, it is the African Yellowbill stork. 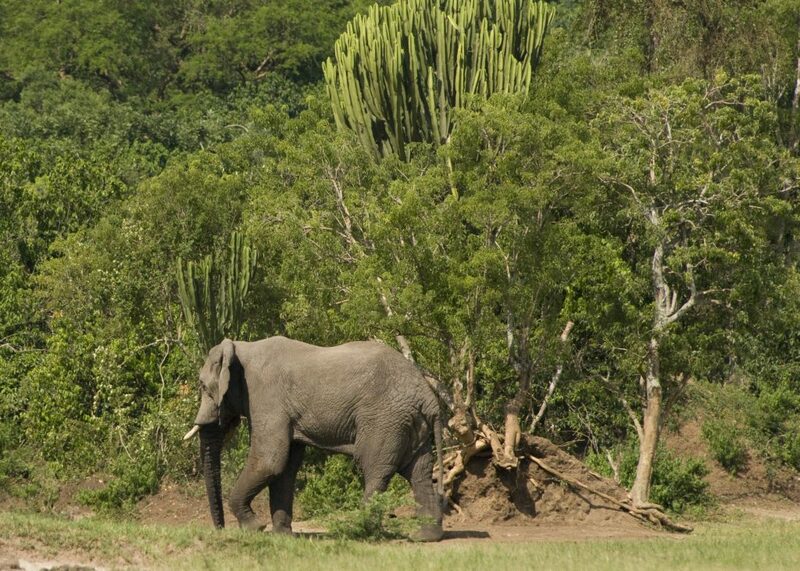 Next time in Uganda, also pay a visit to Queen Elizabeth National Park and the Township of Fort Portal.